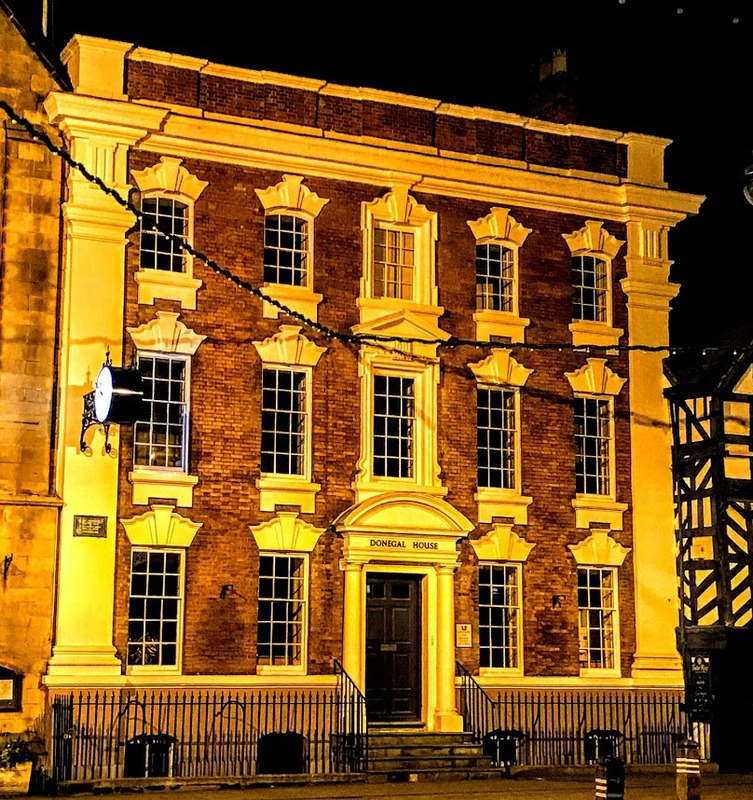 I was writing yesterday [6 December] about the rich heritage in Lichfield of 50 or so timber-framed buildings dating from the 16th and 17th centuries, including Lichfield House or the Tudor café and Five Gables on Bore Street, and the Cruck House. But the notable feature of houses in Lichfield in the early 18th century is the variety of baroque elements found in the decoration of the street façades. The best example of this is probably Donegal House, beside the Guildhall, both of which are between the Tudor and the Five Gables on Bore Street. Donegal House, now the offices of Lichfield City Council, was built in the earlier Georgian style in brick and stucco in 1730 for the Lichfield merchant James Robinson, probably to designs by the architect Francis Smith (1672-1738) of Warwick. James Robinson’s great-grand-daughters, Ellen-Jane and Marianne Robertson, who died in 1812, are commemorated in a marble memorial sculpture by Sir Francis Chantrey (1817) in Lichfield Cathedral known as the ‘Sleeping Children.’ The architect Francis Smith of Warwick was involved with his brothers, William and Richard Smith, in building many cathedral, churches and country houses in the Midlands. The front of Donegal House is five bays, with three storeys above the basement, and the ends are marked by pilasters that support a heavily moulded cornice. The central doorway has a segmental pediment on Tuscan columns and supports the cill and architrave of the central window on the first floor. The window has a triangular pediment that also runs into the architrave of the corresponding window on the second floor. This has a shaped head flanking a prominent keystone that runs into the cornice. The other windows are without architraves, but they have elaborately shaped stone heads with tabled keystones. The windows on the two upper floors also have aprons below the cills. The house was used by the Marquess and Earl of Donegall, who lived at Fisherwick Hall from 1761 until his death in 1799. The Chichester family held large estates near Lichfield but who were a politically powerful family in Ireland, where they had the titles of Marquis of Donegall and Earl of Belfast. 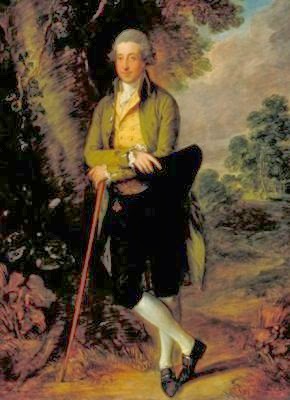 Arthur Chichester (1739-1799), 5th Earl of Donegall, was educated at Eton and Oxford, and he became the 1st Marquess of Donegall in 1791. Through the properties he inherited from his father, he became the greatest landowner of his day in Ireland. His estates included 11,000 acres at Dunbrody, Co Wexford, almost 90,000 acres in Co Antrim, 160,000 acres in Co Donegal, the whole town of Belfast, and the townland of Ballynafeigh in Co Down, totalling over quarter of a million acres. However, he never lived on his Irish estates. Instead, he made his principal residence in Staffordshire, tearing down the Skeffington family’s old Tudor manor house at Fisherwick, replacing it with a vast Palladian mansion set in a park of 4,000 acres, all designed and constructed by Capability Brown. At Fisherwick, he also collected an expensive library and rare specimens of natural history. Before he ever inherited his Irish estates, he bought the Manors of Comberford and Wigginton, including lands in Hopwas and Coton, on 1 August 1789, from Viscount Weymouth – who was about to become the 1st Marquis of Bath – and his son, the Hon Thomas Thynne. Within a year, Lord Donegall had raised £20,000 from the banker Henry Hoare, using the Manors and Lands of Comberford and Wigginton as collateral security. Lord Donegall is said to have rebuilt Comberford Hall, replacing the original half-timbered Tudor manor house dating back to the late 15th century, at the same time as he rebuilt neighbouring Fisherwick Hall. Eventually, the Chichester family, crippled by the gambling debts of a profligate son, would find it impossible to pay off this loan, and would be forced to sell Comberford Hall and the manorial rights and lands that went with it. Donegal House was bought in 1910 to serve as an extension to the Guildhall. The clock on the façade with on enriched brackets dates from 1928. Donegal House was refurbished in 1990. I understand that inside the house still has several of its original panelled rooms with window shutters, and that an original open-well staircase with slender turned balusters also survives. Donegal House and the Guildhall next door were bought by Lichfield City Council in 2012 from Lichfield District Council, reportedly for £275,00. Today, Donegal House is the offices of Lichfield City Council, Lichfield Arts and the Lichfield Festival. The architectural elements seen on the Bore Street façade of Donegal House can also be seen on several other houses, but nowhere else have they such richness. For example, less elaborate shaped window heads are features seen at 8-10 Bird Street, 17 Bird Street, and 15 Market Street. After the mid-18th century, the most fashionable architectural element of Lichfield house fronts was the Venetian window, which was either centrally placed over the entrance, as at 73 Saint John Street, or used to light the principal rooms on the ground and first floors, as can be seen at Davidson House at 67 Upper Saint John Street and Darwin House on Beacon Street. Darwin House, which dates from about 1760, has two other features that were common in Lichfield at the time and may have continued for the rest of the century. These are a string course that continues the line of the first-floor cills and a shallow cornice supported on curved brackets. MW Greenslade, Victoria History of the County of Stafford, Lichfield, (Oxford: 1990-), pp 43, 83, 242-243. Joss Musgrove Knibb, Lichfield in 50 Buildings (Amberley, 2016). Nikolaus Pevsner, Buildings of England: Staffordshire (London, 1974), p 194.